Here's another vintage picture from the Phillip Shales collection. It's a scene from the 1949 Middlewich Carnival procession as it passes along Lower Street. In the background are several buildings we've seen before in our Middlewich meanderings but never before at this particular period in time. They are, from left to right, the White Bear, Dewhursts butchers, the shop later to become Vernon Coopers - does anyone know when Vernon Coopers moved into this shop and what kind of shop it was before they took it over? I have a feeling that 1949 is a little early for the radio, TV and electrical retailer to be there - and Stanways fishmongers (or 'fish dealers' as the sign on the premises would have it). Don't forget, also, that the 'Vaults' was still there, set back from the road and hiding in the space between the White Bear and Dewhursts. Many people mistake the Vaults for a new building which replaced what was on the site before but no - it was there all along. To the left and right we can see evidence of the huge crowds following the procession. And there are still more taking in the scene from the upper windows of the shops, which is something people rarely do nowadays. As we've seen before, large numbers of people attend events in our town centre these days, but in former times masses of people approaching football crowd proportions thronged the town centre and the streets leading to it. Which neatly brings us to the 'float' taking centre stage. As far as I can make out, the 'Bogota Boys' must be a reference to the World Cup which was revived for 1950 (amid much controversy, apparently) and the qualifying heats would be taking place at the time of the 1949 Carnival. I can't, however, find any reference to a team from Bogota having qualified for the contest, and to be heading off for Rio De Janeiro where at least some of the matches were played (hence the sign saying NOW TRAINING FOR CUP TIE AT RIO). The link with Rio is an interesting one; both Rio and Middlewich have always been famous for their carnivals, although it has to be said that one of them knocked the other into a cocked hat. Poor old Rio. I'll leave it to those better versed in football history to decide why this particular team of Middlewich athletes should have decided to name themselves after a Colombian team. Our Bogota Boys look much more likely to be heading to the British Legion than footballing glory in Brazil. HELP THE LEGION TODAY. YOU MAY NEED THEIR HELP SOME DAY. 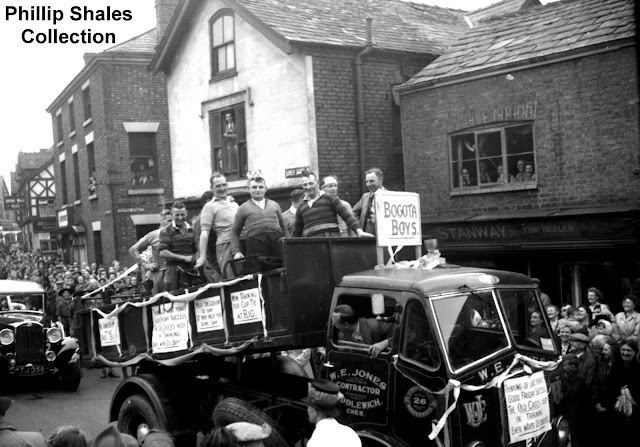 In accordance with another long standing Middlewich tradition the truck (or 'lorry', to be more in keeping with the spirit of the times) was provided by W.E. Jones of Middlewich, something the firm would continue to do for many years to come. And there's another Middlewich link here, in that the lorry was made by the then only sixteen year old ERF Ltd at the Sun Works in nearby Sandbach. (the company later had a more direct involvement in Middlewich when it moved its spares and repair facilities here in the early 1970s). 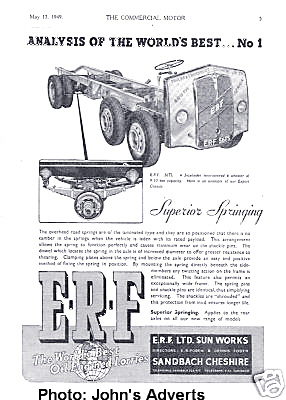 You can just make out the 'sunray' ERF logo underneath that hand-lettered sign on the front of the vehicle. If you want to get your modern-day Middlewich bearings, that lorry would be just to the right of the access road that now runs from the Bullring past The Vaults and out onto St Michael's Way. And finally, just take a look at what is occurring as the Bogota Boys make their way along the streets of post war Middlewich. Their lorry is a tipper and the driver has, for the amusement of the crowd, decided to operate the tipper mechanism, humorously threatening to decant the Bogota Boys onto Lower Street. UPDATE (31st December 2016) We have now found out the identity of the lorry driver. It's none other than Ivor Niblett (Senior), father of Ivor (Junior), Jessica, Don and Chris. Or, as Don himself put it, in fine old Middlewich style, 'our owd chap'. Editor's Note: Other photographs found in the same computer file as this one have been proved to actually come from the 1952 Carnival. Because of the 'World Cup' connections mentioned above, we've decided to leave this one dated as 1949. If you have any information as to the true date of this photo, please get in touch. Such a stunningly evocative picture of a long lost era couldn't fail to provoke a lot of comment. Here's some of it -ed. Geraldine Williams This is such a good photograph showing how important an event the Carnival was in those days with people turning out in force. I can just about remember when the King and Queen drove along Wheelock Street as part of their tour of the country celebrating the end of the war. The street was packed for that historic event too. My father had an electrical shop in Wheelock Street and fitted coloured lights round the window. Of course he wasn't allowed to have them switched on because of the restrictions on power still in force but Dad flicked the switch on and off as the royal car passed by and they caught the King's eye, much to Dad's satisfaction. I don't think anyone had ever heard of Bogota before the football connection. 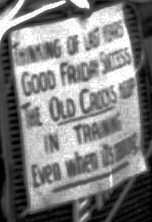 The Old Crocks football match on Good Friday was an annual institution but I can't remember who their opponents were. The shop at the corner of Pepper Street was once a crockery shop owned by a family from Winsford called Dutton, probably about the time of this photograph. My mother was keen to start collecting Wedgewood crockery - the original blue with the raised white grapevine border - which the Duttons sold but her entire collection comprised of two dishes so I don't know whether it was because the Duttons sold up or mother's funds ran out!! Andrew Tomlinson They couldn't be the Bricker Cup winners, could they? There were major riots and unrest in Bogota in 1948 - could they have picked the name as some strange pun? There does seem to be some kind of cup or trophy on the roof of the lorry's cab. And does it really say that W E Jones' phone number is Middlewich 26 on the door? By the way, the 1950 World Cup was held in Brazil and England went out in the group stages, famouly losing 1-0 to the USA! Geraldine Williams Didn't the England team do their training in Bogota to acclimatise for the World Cup? Andrew Tomlinson Are you thinking of 1970 in Mexico? In any case that wouldn't have been in 1949. I still think this team looks more like a Bricker Cup side. I'm just talking to Mum now and she seems to think there was a team called 'The Old Crocks' who played once a year for a cup - she can't remember who they played, but thinks it was against the same team every year, and the game was played Easter Weekend, although she can't be 100% certain. I seem to remember similar matches to the one Mum thinks she can remember, being played on the same day as the Bricker Cup final. The reference to Rio will be the FIFA World Cup for certain, as 1950 was the first year that England took part. Daniel Preston Relatives of ours lived in the upstairs flat at the Vernon Cooper building in the 1950s. They were my dad's cousin and her family. I can remember my second cousin playing with his lead soldiers by the fire. Dave Roberts By coincidence, I knew the family which lived there in the late 60s/early 70s. They were Frank Ryder and family, formerly of the ICI farm near Wimboldsley. Their son Stuart, now sadly passed away, was my first 'best friend' at Wimboldsley School when i started there in 1957. The WHITE painted shop used to sell crockery and glass ware. It also had a Victorian Glass cover over the front of the shop, but this was taken out by a double decker bus some time shortly before this photo (think). For those still not sure of the location they are coming down Wheelock st the wrong way to todays flow you can just see the White Bear in the back ground. I can remember Middlewich Agricultural show being one of the biggest in the area was on Whites field what is now Mid Point 18.